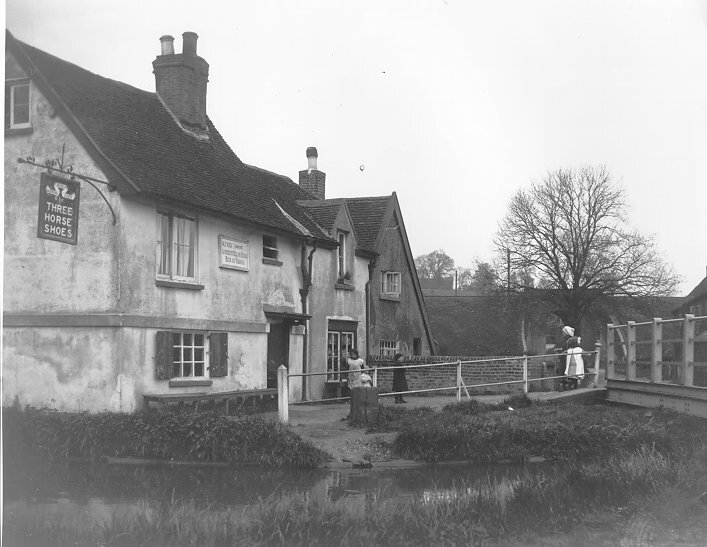 The Three Horseshoes, Winkwell circa 1916. Trooper Road Aldbury, House Nos. 40 to 44. Photograph showing Sebright Road, Boxmoor. The derivation of street names is a far more complex and fascinating subject than might appear on the surface. Some names are so old their origin is lost in the mists of time. Some have been so altered over the years they bear little resemblance to the original. Some commemorate local worthies, others have their origin in local field names. A shop or business or even the local pub might give its name to that area. Sometimes, nothing grander than a patch of thistle gave rise to the street name such as Thistle Croft. Plant names have always been popular, such as Box Lane or Juniper Green. Cherry Bounce, in the High Street of Hemel Hempstead, refers back to the days when cherry orchards were a local feature. The road was probably poorly made, hence the ‘bounce’ when riding down it! Let’s have a closer look at other street names in Dacorum. This is the Anglo-Saxon name of the old Roman Road from Colchester via St Albans (Verulamium) and Tring to Alchester and Cirencester. Perhaps it is derived from the idea of the ‘aching man’ going to refresh himself in the medicinal waters of Bath? The present day Akeman Street links the original route through Tring Park to the High Street. The Romans apparently by-passed Tring long before the Motorway did. Named after an ancient brook, now a feeder of the canal. A man called Narraway used the field that once bordered it for growing herbs to manufacture perfume in 1830. 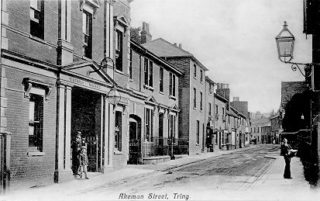 The Verney family had long associations with Pendley and Tring. Robert Whittingham’s daughter married John Verney after the Battle of Barnet and the restoration of her father’s lands. The Verneys remained at Pendley for nearly 150 years. They served the Royal families of England in many ways; Sir Edmund Verney was a captain in the fleet that attacked the Spanish Armada. This is a very winding road down the hill. The name apparently derived from its nature. There has been a public house in this road for over two centuries. The Trooper Alehouse became The Valiant Trooper in about 1890. Ann Hall and her cousin, Martha Parrott, the publicans there at the beginning of the 19th century, had many duties. They dealt with the parish post, provided lodging for the needy and dispatched food and drink on prescription! This is named after William Archer, a dramatist of some distinction, who founded a ‘Nerve Colony’. People who needed to relax came to what was then a quiet, rural spot overlooking the Gade Valley to recuperate from the hurly-burly of everyday life. The close was built in 1961. The houses in thia close were built in the 1960s in what was once Dr Fisher’s garden. He lived in Little Hayes, fronting the High street. The house was demolished after his death, to make way for flats. Austin was the name of the grocer who kept a shop at the junction of the yard and the High Street. It was formerly known as Plait Market Yard, a reference to the important straw plait trade in Dacorum in the 19th Century. ‘Wincel’ meant a corner in Old English. A community grew up around the mill, farmhouses and inn, smithy and cottages. The canal brought new interest to the area in the 1790s. The Three Horseshoes is an interesting old pub, showing various stages of building additions over the centuries. There was once a wharf here and coal was carted up to Westbrook Hay. The Sebright family lived at Beechwood Park, near Markyate. 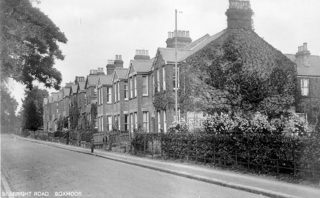 Several generations were benefactors in Flamstead and Markyate. Sir John Sebright gave Cheere House and helped to fund the move of the West Herts. Infirmary from its first home in cottages at Piccotts End. From an Old English word, ‘sceacere’ or ‘robber’, gives the meaning of this name. ‘Robbers’ way’ may have been so called due to highway robberies being committed along its length, or there may be a reference to the gallows. It may be an ancient trackway, linking to Sugar Lane in Bourne End. The hedgerow has been dated and is believed to be about 800 years old. 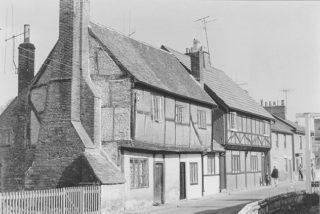 The oldest recorded street name in Berkhamsted, it was named in a charter of 1318. 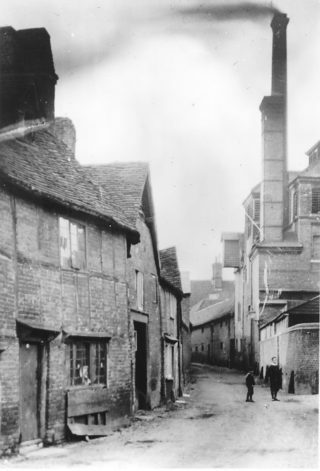 It is one of the original old streets of the town, the others being High street, Castle Street and Mill Street.